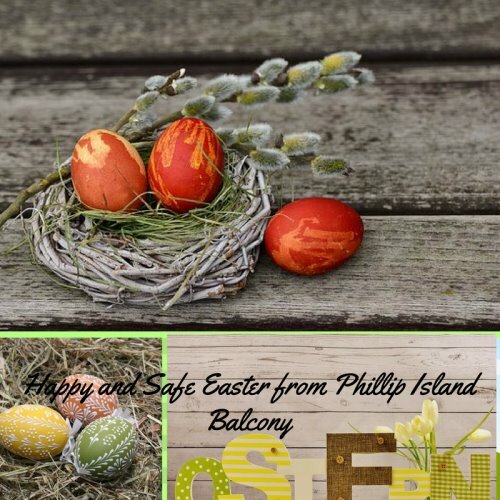 I am very happy to announce that phillip-island-balcony.com is now a secure website. If you go to my website you will now see that it has the green lock symbol. This indicates that my site has been authenticated and protects the privacy and integrity of any exchanged data. So please browse the site knowing it is secure! This year the Easter weekend is not only at the start of April it is also the start of the Victorian school holidays. And April is shaping up as a very busy month on Phillip Island! 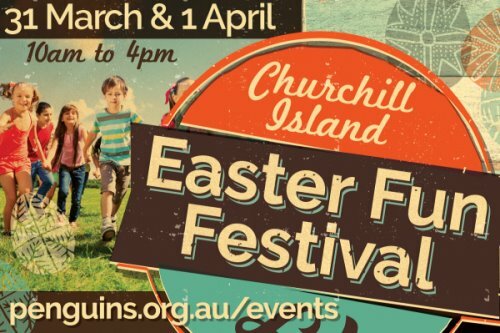 The annual Easter Fun Festival at Churchill Island returns with fun for all the family. Kids activities include mini golf, arts and craft activities, face painting, giant games as well as roving puppetry performances. The Heritage Farm will host demonstrations of the much-loved working horses, courtesy of the Victorian Heritage Draught Horse Club, plus a whole range of traditional hands on farming activities and demonstrations including tractor rides, cow milking, sheep shearing, working dogs and whip cracking. Step into yesteryear with a wonderful display of vintage cars and caravans. The Festival Lawn is a great place to sit back, relax and enjoy a bite to eat or a drink while listening to the sounds of local musicians. The popular Easter Egg Hunt will take place on Easter Sunday morning. During the school holidays The Antarctic Journey at The Nobbies will host a range of intriguing and interactive experiences as part of the Fascinating Science travelling exhibition. Aimed primarily at children aged 8 to 14, activities cover topics of logic, balance, fluids, illusions and mathematical puzzles of varying complexity. The fishing village of San Remo hosts the Easter Fishing Competition. A fundraiser for the Royal Children’s Hospital Good Friday Appeal, there are categories for adult, junior and small fry with prizes for heaviest squid, whiting, flathead and gummy. 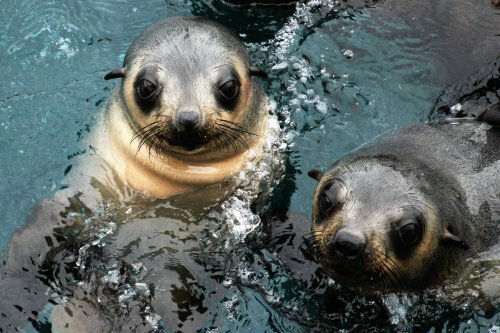 For Easter and the school holidays, Wildlife Coast Cruises will run extra cruises to Cape Woolamai and also extra daily cruises to Seal Rocks. In autumn, seal pups are swimming, diving and practising prey-catching under the watchful eye of adults. Once the Easter weekend is done, there is the surfing favourite of the year – the Phillip Island National Surfing Reserve Tag Team Surfing Challenge on April 14. For this event teams with members including men, women, junior, grommet, longboard, twin-fin and more compete for the title. On April 20/22 supercars return to the Phillip Island Circuit for round three of the WD-40 Phillip Island 500 Supercars Championship. The same weekend is World Penguin Weekend. At The Antarctic Journey at The Nobbies, visitors can learn about penguins, plastics and our impact on the oceans via presentations and activities. For music lovers there is the monthly Sunday Jazz session at Ramada Resort on April 22, featuring Jackson Four. During April the regular Island Craft Market, Churchill Island Farmers Market and Market on Chapel will take place on their usual weekends. A very busy month indeed! And remember bookings are essential for the Penguin Parade over Easter and the school holidays! The hottest dining destination since it opened towards the end of 2017 has been Saltwater, situated on the Newhaven Jetty. What once appeared to be a derelict shed has now become a sleek, modern restaurant. 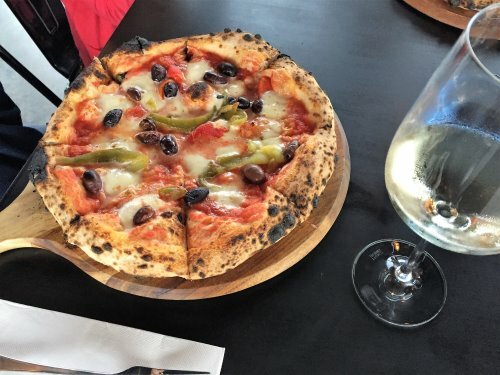 Saltwater specialises in pizzas from its traditional wood fired oven from Naples, but the menu also has other options such as tapas, steaks and seafood. Local produce is used where possible such as Kite Haven olives used in pizza toppings. I order grilled local flathead tails which is served with a salad of mixed leaves and fennel dressed with a tasty mayonnaise. 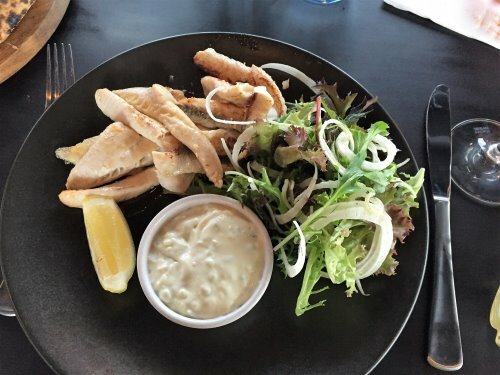 Normally the flathead is crumbed but the chef grills them to make them gluten free – thanks! For drinks, there is wine from local winery Purple Hen and beer from new Phillip Island brewery, Ocean Reach. Pizzas are now available for take-away if preferred. If you just want a drink there is bar seating next to open windows to enjoy the view. The setting for Saltwater must be one of the best on Phillip Island with views on three sides looking over the water to San Remo and the mainland and the Phillip Island bridge. The only downside for Saltwater is the difficulty in making a reservation. The preferred method is via Messenger but is not very satisfactory. We visit with children and had been told if we arrived at 5.30pm we would not need a reservation, but this is not the case as the restaurant was booked. Luckily, they manage to squeeze us in. By 6.00pm the restaurant is almost full. In mid-April the annual migration of the short-tailed shearwater begins. These birds will fly about 16,000 kilometres from Phillip Island to the Aleutian Islands off Alaska. They will feed there during our winter months. The adults leave first, followed about two weeks later by their chicks. At this stage the chicks are only three months old, so it is no wonder that maybe 50% will not survive their first year. As this is the first real flying test for the chicks, many are seen on the island’s roads as they learn to fly. They are also attracted to the lights on the Phillip Island bridge. Because of this the lights will be switched off during the peak migration time. 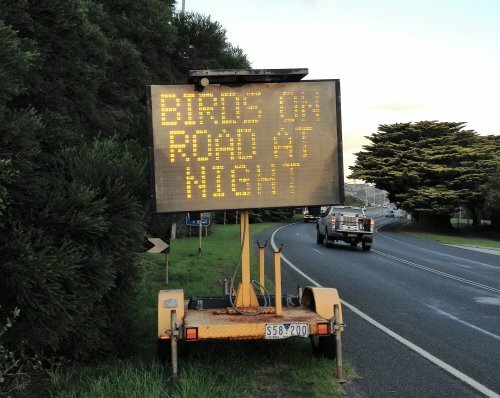 There will be signs along roadsides warning motorists that the lights will be off, and also to warn drivers about birds on roads. Motorists are asked to drive carefully. Phillip Island Nature Parks will be patrolling the main areas such as Cape Woolamai, looking for injured birds as part of their Shearwater Rescue program.